Just a few days before setting out on a road/bike trip to sample some of Maine’s most famed lobster roll joints, we happened to see a short segment on the Travel Channel’s “Man vs. Food” featuring The Lobster Shack at Two Lights (you can view the segment here). Our home base for this trip was The Danforth Inn in Portland, so a quick stop in Cape Elizabeth was right on our way. The Lobster Shack is certainly situated on a beautiful ocean-front property overlooking Casco Bay. 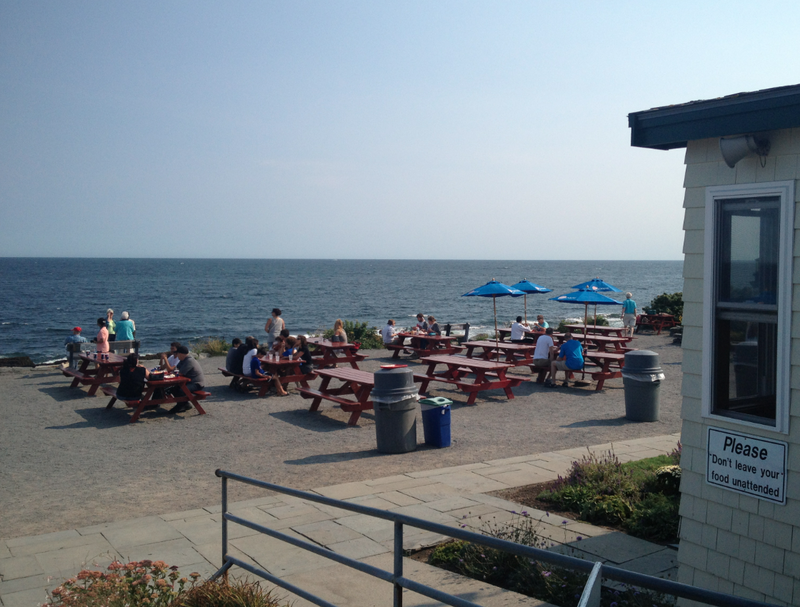 The view alone was worth the trip, and we were very eager to sample the first lobster roll of our trip. The Lobster Shack makes their rolls to order – a definite good sign – and, after a short wait, our name was called and we proceeded to the pick-up window to collect two very interesting looking lobster rolls. This lobster was fresh, and filled with not only claws and knuckles, but also tail meat. Interestingly, though, The Lobster Shack does not use either mayo or butter in their roll, instead placing a dollop of mayo one end of the finished roll. This meant that, unless you took the time to spread the mayo yourself, each bites had either contains no mayo, or way too much. On the other end of the roll was a pickle slice, which is fine if you like pickles (one of us doesn’t), but the inevitable consequence is that you end up with at least some pickle-flavored lobster. Finally, these rolls are finished off with a dusting of paprika which, although a bit off the reservation, didn’t do any damage. 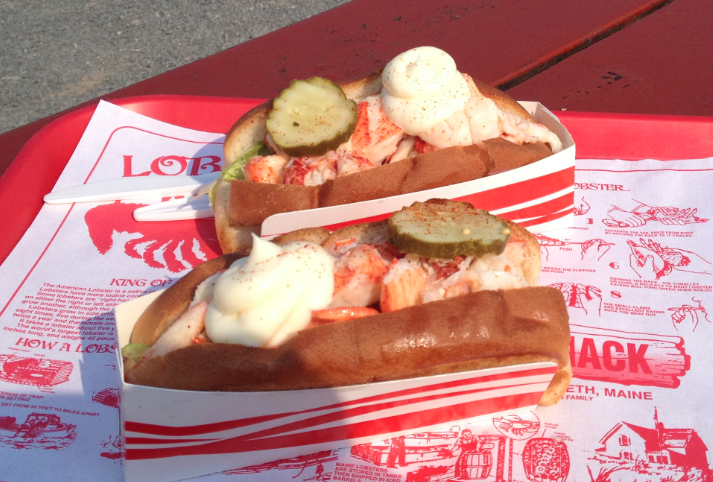 In the end, despite the cool, artsy look of these rolls, The Lobster Shack’s lobster roll is more-or-less unmemorable. Was this a bad lobster roll? Absolutely not. But at something like $18 per roll (again, with lobster meat selling for about $3.95 per lb. ), we got the sense we were paying more for the view than for the roll. 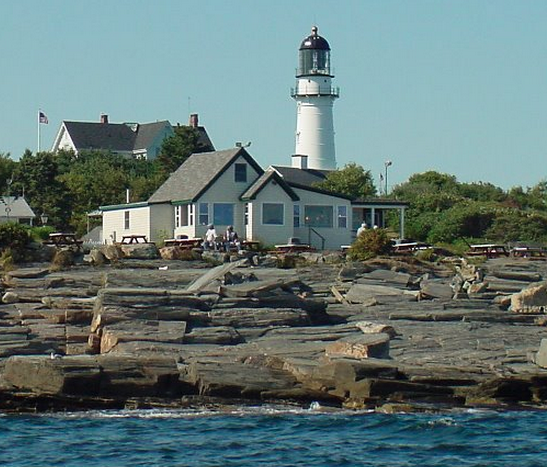 The Lobster Shack at Two Lights can be found at 225 Two Lights Road in Cape Elizabeth, ME. WEBSITE: http://lobstershacktwolights.com. FACEBOOK: https://www.facebook.com/lobstershack. PHONE: 207.799.1677. Check their schedule, as this is a seasonal business. Very pretty rolls, but otherwise unmemorable.